November 9 is a very unique day for Germany, as Manuela Schwesig (SPD), premier of Schleswig-Holstein (Northern Germany), described it today. 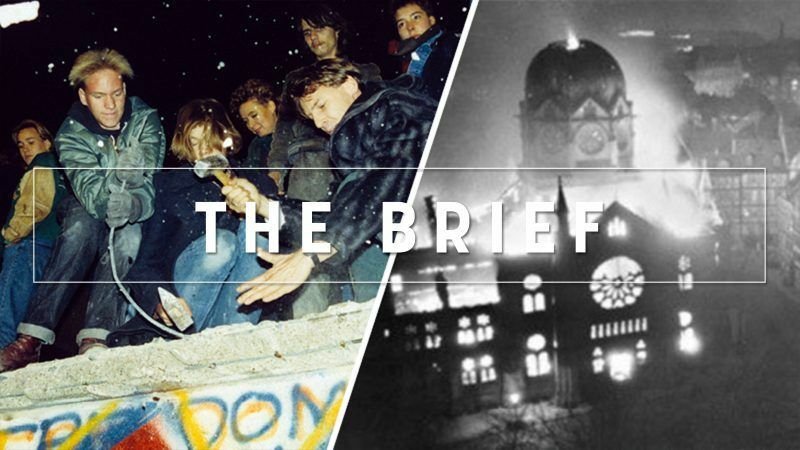 It is a day when three pivotal events took place, with far-reaching effects for Germany but also for Europe. This date stands for two of the most beautiful events in German history, but also for the darkest hours of its past, she said. Schwesig recalled that on November 9, 1918, the Weimar Republic was proclaimed in Berlin, while in 1989, the Berlin wall came down. While the fall of the Berlin wall still brings back memories for many of us, little is known outside Germany of the Matrosenaufstand or ‘Kiel mutiny’ – the event Schleswig-Holstein’s Premier was referring to in her speech, which preceded the proclamation of the Weimar Republic. So what was the ‘Kiel mutiny’? It was a major revolt undertaken by sailors of the German High Seas Fleet that took place on 3 and 4 November 1918 in Kiel, today’s capital of the northern state of Schleswig-Holstein. The revolt triggered the German revolution, which was to sweep aside the monarchy within a few days and ultimately lead to the end of the German Empire and to the establishment of the Weimar Republic. Although the Republic disappeared after only 13 years, its achievements include, for example, women’s suffrage, the anchoring of fundamental rights in the constitution and the collective bargaining agreement between employers and employees, Schwesig stressed. On a much more ominous note, on 9 November 1938, the National Socialists launched a systematic attack on the Jews with the Pogrom Night, also known as Kristallnacht, which was a prelude to the Holocaust. “November 9, 1938 will always be a day of shame in German history,” Schwesig said. But not only for German history. European Commission President Jean-Claude Juncker also stressed Europe’s responsibility. “Today’s Europe has a lot to be proud of but we must never forget our past. On the 80th anniversary of Kristallnacht, we have a duty to remember what happened. Attacks on Jews are attacks on all of us – against our way of living, against tolerance and against our identity,” he wrote in a tweet. And indeed, the three events are also a reminder for all Europeans: fighting for freedom is always difficult and you can lose your life for it, whereas falling for authoritarian regimes is much too easy. Over the past 20 years there has been a 20% decline in cancer deaths. The EU will need solidarity to handle migration, the biggest failure of the 2014-2018 period, Kathleen Van Brempt said in an interview. The Left’s Gabriele Zimmer urges leftist parties to escape from ‘self-isolation’ and seek majorities. The far-right rise in Europe needs a progressive federalism response, a Greek Syriza minister believes. European defence cooperation takes another leap forward as Finland becomes the tenth participant country in Macron’s European Intervention Initiative. The midterms in the United States were not subject to an intervention due to a lack of Russian resources. But will the upcoming European elections also go under Moscow’s radar? Whether humankind fails or succeeds in keeping the rise in global temperatures within manageable levels, central banks will sooner or later be called upon to act, an ECB executive says. Foreign companies have encountered problems related to the protection of intellectual property in China. But the Chinese market is ‘too big to ignore’. The EU’s Economics chief Pierre Moscovici insisted there was little room for Brussels to compromise with the Italian government over its budget plans as he unveiled the Commission’s latest economic forecasts. Common borders, common solutions? The Romanian-Bulgarian cross-border regional cooperation programmes aim to create a “bridge” between the two countries in order to support the border regions. It was indeed a busy Brussels bubble week. Watch our latest Tweets of the Week where we recall how Orban’s face landed on a van, Manfred’s became the EPP man and Salvini lost a fan. It is Strasbourg week again next week and German Chancellor Angela Merkel will deliver her Future of Europe speech. In the meantime, Europe will mark the 100th Anniversary of the end of the ‘Great War’ with a ceremony in Paris on Sunday.